Summary: But not everyone was happy with the success of the Church. The religious establishment that had opposed the ministry of Jesus, and then crucified Him, took the same hostile approach toward the Apostles. After Pentecost, the message of the resurrection of Jesus Christ spread rapidly in Jerusalem as Spirit-empowered witnesses shared the Gospel with the lost. Signs and wonders accompanied the preaching of the Word and no one could deny that God was at work in a new way among His ancient people. But not everyone was happy with the success of the Church. The religious establishment that had opposed the ministry of Jesus, and then crucified Him, took the same hostile approach toward the Apostles. Jesus told His Apostles, “Remember the words I spoke to you: 'No servant is greater than his master.' If they persecuted me, they will persecute you also. If they obeyed my teaching, they will obey yours also” (John 15.20). He also told them, “They will put you out of the synagogue; in fact, a time is coming when anyone who kills you will think he is offering a service to God” (John 16.2). His words were beginning to be fulfilled. 1. 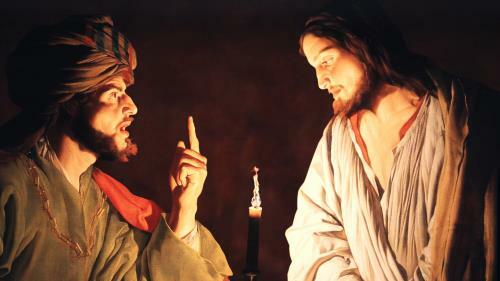 Peter and John had not obeyed the official orders to stop preaching in the name of Jesus Christ. They were guilty of defying the law of the Jewish nation. 2. The witness of the Church was refuting the doctrines held by the Sadducees, giving evidence that Jesus Christ was still alive. 4. The healing power of Peter had attracted too much attention, and a threat of a popular disturbance loomed above the horizon. The Sadducees saw that they must take some sort of action, and take it quickly. 5. The multitudes came to hear the Apostles preach and to have their sick folks miraculously healed. The healings and miracles wrought by the Apostles gave them tremendous popularity and prestige in Jerusalem, and so enraged the religious leaders and filled them with indignation that they “rose up” in opposition against these men of God. The situation was similar to that following the resuscitation of Lazarus (John 11.47-53) when the leaders could either believe—which they would not do—or decide to take desperate measures involving violence, despite the danger from the mob (common people). “The high priest rose up, and all they that were with him” includes not only the high priest and his relatives, but also the leaders of the Sadducees—in other words, all the Jewish religious authorities and rulers. “Which is the sect of the Sadducees.” The Sadducees were a very powerful group—as we will see in verse 21 of this chapter. They had the power to bring the Apostles to trial and to mete out any punishment they decided upon. 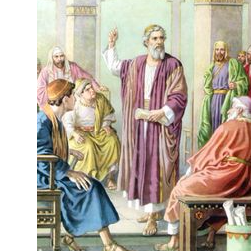 History assures us that the Sadducees also had the rich people on their side. It is not clear in the Scripture that Annas (high priest at that time) was a Sadducee, But Josephus in his book on Bible antiquity declares that the son of Annas was of that sect, and there is a possibility that Annas also was a Sadducee. Of course the Apostles declared that the bodily resurrection of Jesus proved that He is the Son of God; and since the Sadducees did not believe in the resurrection and life after death, they hated such a message and “were filled with indignation” against the Apostles. But not everyone was happy with the success of the Church. The religious establishment that had opposed the ministry of Jesus, and then crucified Him, took the same hostile approach toward the Apostles.